An active learning resource that Christopher Boone would enjoy! 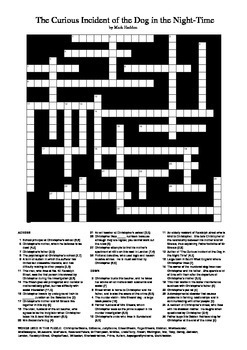 Crossword based on the novel by Mark Haddon. 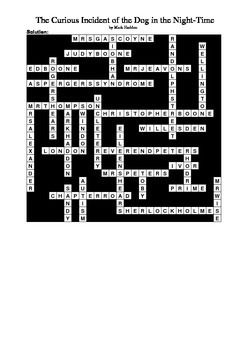 There are 29 clues - each is the name of a character, or a place mentioned in the novel. There are also a few words useful to the study of the text - Autism, Asperger's Syndrome and Prime (number). To see the words used in the puzzle, download the preview file, which is the solution. This resource/activity could be used as class or homework, to help revise the text, or just for fun. I've specifically written the clues to help students learn/remember key facts about characters and places, by including a lot of detail. It could be used as a filler on a day when you have nothing else prepared. There is a word bank to assist students. You could redact this to make it more challenging. The solution is also provided.